Read on as I share four things I learned about planning a summer praise dance camp for children and to watch a 4-minute video recap of the week. 1. Don’t let a late start planning stop you. I felt the nudge to hold this camp in April, with a clear sense of direction from the Lord and a host of ideas. I got right to it, even though it was fairly late in the year to schedule a summer camp. I am so glad I did. I learned so much, gave so much, and gained so much. So, although camp wasn’t large, it was powerful for me and for those who attended. 2. Next year, begin planning in January next year. I learned that most of the local newspapers that advertise summer camp options have February deadlines for submissions. So, I plan to get the dates on the calendar early. (In fact, I just emailed a contact about renting the space during the last week in June of 2016). I also plan to have a flyer ready early for the Christian schools in town and ask if they send a packet about summer camps to their students. There were many ways to get the word out about this camp that I didn’t do because I started planning in the end of April. Next year, I’ll be ready to take advantage of those avenues. 3. Don’t despise the days of small beginnings. The Lord gives us what we are ready for at the time. This camp had five children. It was enough to build community, to do group activities, to choreograph a presentation dance. It was just right. By teaching these five, I grew in both skill and confidence in my ability to teach a dance camp. I also gained the experience of combining the lessons from my own curriculum, from Devotions in Motion, and all the other concepts I’ve studied over the past several years into a cohesive format of a week’s study. Just before camp began, I heard familiar voices in my head asking, “Who are you to teach a dance camp?” “You have no business doing this,” and “What makes you think you can teach all these subjects to children?” The enemy disguised his voice by masquerading as my own insecurities. On the last day of camp, after spending two hours each day pouring into the students, teaching them modern dance, biblical principles of worship, expressive sign language, and choreography, among other things, and after teaching them an entire presentation dance, I thought, “I have so much more to teach you! I’d love to go for another week.” I meant it. 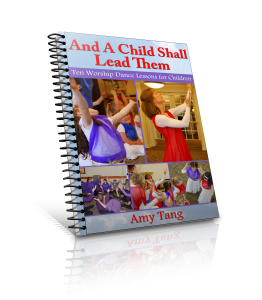 I watched the children progress in dance, in choreography, and in worship. I saw the joy they experienced. And I had so much more to share. I can’t wait until next year. 4. Keep stepping out. In dance, God has given us a gift that brings joy to others and changes lives. We only get to see that when we use those gifts. flags and learning some sign language! My girls thoroughly loved the praise dance camp. At the end of it, the girls were glowing with pride and satisfaction. They loved learning the choreography to the worship song and kept singing and dancing to it after camp was over. I know they learned great principles of praise and worship and can now incorporate a devotional song in their own worship at home. They enjoyed being with the other children worshiping and learning together. They said they had a great experience and would go back again! The more we use the gifts God gives us, the more we grow in them. So, I learned, once again, that I need to lay down my self centered insecurities and continue to seek out ways to give away the gift of dance. Please share in the comments: What project is on your heart to do? How will you go about getting started? Does the enemy disguise himself as your own insecurities? How can you override those and move forward in faith? What a blessings thank you for sharing your experience. And the testimonies are so encouraging. Sure, Pat. I’ll pm you on facebook. Thanks! Wonderful. very encouraging. God bless!. Thank you, Shandra. I’m learning more as I’m planning this year’s camp. I’ll share that afterwards. Bless you. You sharing this testimony was absolutley awesome. It came at a time I needed it dearly. I’m so glad to hear that. Thank you for letting me know. That encourages me.